CarGurus has 2,711 nationwide Verano listings starting at $3,999. Although it won’t win any prizes for its looks, driving panache, or fuel efficiency, the 5-passenger Buick Verano compact sedan is, nevertheless, a solid choice for the small family on a budget. Expected to return with few changes for 2016, this downsized 4-door offers a hefty selection of creature comforts, not to mention some impressive safety features, and there’s also a turbocharged version that posts a 0-60 time of 6.6 seconds. The 2016 Verano is available in 5 trims, the entry-level 1SV Group, the well-equipped Verano Group, the up-featured Convenience Group, the plush Leather Group, and the turbo-toting Premium Group. All trims, of course, return only in front-wheel drive (FWD), and all boast a fairly capacious 14.3-cubic-foot trunk. Unfortunately, in following the trend toward sleek and chic, the 2016 Verano again sports a shortened trunk lid that’ll make a helmet all but mandatory when loading luggage or groceries, and that comparatively spacious acreage also cuts noticeably into rear-seat legroom. Virtually all in the media expect a comprehensive reworking of the Verano lineup, including a new powerplant, a heavily tweaked profile, and a bunch of upgrades to standard and optional cabin bling based on this small sedan’s showing at the 2015 Shanghai Auto Show. For reasons known only to corporate fiscal management types, however, this revamped Verano is set to go on sale in China in a few weeks, while we here in the U.S. will have to wait till the 2017 model year to see the changes. Thus, look for the 2016 Verano in 1SV, Base, Convenience, and Leather form to return powered by a competent though hardly eye-popping normally aspirated 2.4-liter inline 4-cylinder (I4) engine. Mated with the standard 6-speed shiftable automatic transmission, this yawn-inducing I4 puts out 180 hp and 171 lb-ft of torque, with mileage returning at a tepid 21 mpg city/32 highway/25 combined. Not the stuff of legend. However, the 2016 Verano Premium Group makes up for the above shortcomings with its standard 2.0-liter turbocharged I4 that’s good for 250 hp and 260 lb-ft of torque. The 6-speed shiftable automatic is again standard with this force-fed 4-cylinder, while an available 6-speed manual transmission remains optional for those who take their commute a little more seriously. Mileage estimates for the turbo I4 aren’t that bad, either, remaining an anticipated 21/30/24 in automatic-toting versions and 20/31/24 in stick-shift-equipped editions. In keeping with Buick’s standing as a quasi-luxury branch of the GM family tree, look for even the basic 1SV to tote such upper-crust adornments as 17-inch alloy wheels, cloth upholstery, and full power accessories. Additionally, this starter trim is expected to again sport standard cruise control and telescoping tilt-wheel steering, along with dual-zone automatic climate control and OnStar Directions and Connections technology bolstered by 4G LTE Wi-Fi capability. To this, the higher trims add such standard niceties as remote engine start, a rear-view camera, Buick’s IntelliLink infotainment with a 7-inch touchscreen, and Bluetooth hands-free communications. Look for the Convenience Group and higher variants to again add 18-inch alloy wheels, rear parking sensors, heated power-adjustable outside mirrors, heated front seats, a power-adjustable driver’s seat, a heated steering wheel, leather upholstery, a heated steering wheel, and a remote garage door opener to the list of standard bling. Furthermore, the flagship Verano Premium Group is again scheduled to carry a rear spoiler aboard its otherwise unremarkable exterior. Entertainment for the lower Verano editions remains a 6-speaker stereo boasting a CD/MP3 player and a USB port, while the Leather Group and the Premium Group each return with a 9-speaker Bose premium system that additionally boasts 3 months of complimentary satellite radio service. Noteworthy options, meanwhile, include a power sunroof and GPS navigation, each of which remains available to all trims except the 1SV Group. As for standard safety equipment, expect the 2016 Verano trim stable to return toting 4-wheel antilock brakes (ABS), traction and stability control, front and rear side-mounted airbags, front and rear head curtain airbags, and daytime running lights. Additionally, look for OnStar emergency telematics to remain standard in the upcoming year, along with a post-collision safety system and a remote antitheft alarm. The Leather and Premium groups also remain slated to sport standard front fog/driving lights, while the Convenience Group and its Premium Group sibling both return boasting standard blind-spot monitoring, lane departure alerts, and a forward-collision warning system. As mentioned, the current Verano lineup sports a perfect 5-star crash-test rating from the National Highway Traffic Safety Administration (NHTSA), while the Insurance Institute for Highway Safety (IIHS) gives this compact Buick sedan its best score of Good in all of its various safety tests. Expect the 2016 Verano lineup to start appearing in dealerships in the late summer of 2015, where it will again rival the likes of Acura’s ILX, Audi’s A3, and Mercedes-Benz’s CLA-Class. 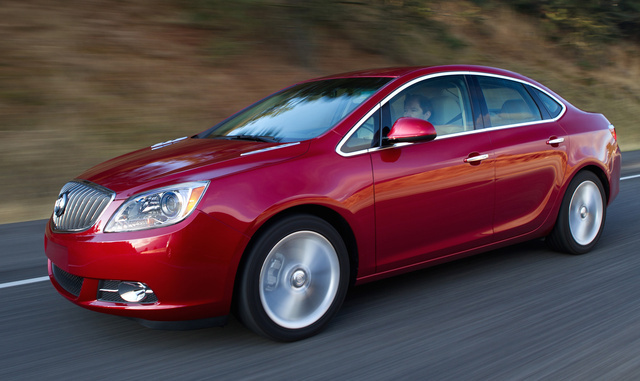 What's your take on the 2016 Buick Verano? 1nbracken Let's talk about the Buick Verano. Can I call you or would it be better if i just email you? I have multiple questions. Have you driven a 2016 Buick Verano?